It’s said all good things must come to an end and that apparently includes undefeated streaks. The Wellington Dukes tasted defeat in regulation for the first time in over a month on Sunday as the club fell 5-1 to the host Whitby Fury. But until Sunday’s setback, the Dukes had managed to squeeze 17 of a possible 18 points out the nine previous hockey games dating back to an overtime win over the visiting Kingston Voyageurs on Dec. 21, 2018. Wellington (25-18-4) preceded the loss with a key 4-3 divisional win in Kingston on Thursday and followed it up with perhaps one of the most dramatic regular season home ice wins in recent memory as they dulled the high flying Oakville Blades 6-5 in overtime. Their first loss of 2019 was nothing to write home about as the Fury sought and exacted some revenge for a 4-1 road loss to Wellington Jan. 11 but you won’t find too many Dukes-Players or coaches- feeling sorry for themselves and moping around the dressing room. On Sunday, after an emotional home ice victory that saw Wellington blow a two goal lead in the third, fall behind late, tie the game with the goalie pulled and win with under three seconds left in the second and final overtime, the Dukes were ripe for the picking against a well coached Whitby team. Druce said the streak was bound to end at some point but Wellington showed its best hockey of the season so far and that was an encouraging sign. “When the players do what we are asking and bring the work ethic, it’s very evident. There’s no grey areas. We are all on the same page, doing what’s required and we are successful,” The coach added. After a scoreless opening frame, Wellington struck first in the second as Tyson Gilmour notched his his 18th goal of the season off a feed from Dylan Massie at 5:32. Wellington’s only lead of the game lasted exactly 14 seconds as former Wellington Dukes fed Jacob DiDanieli for an equalizer. Smith second of three helpers in the frame to Nick Lund at 9:54 was the eventual game winner in a 5-1 game where the clubs each had 30 volleys on net. 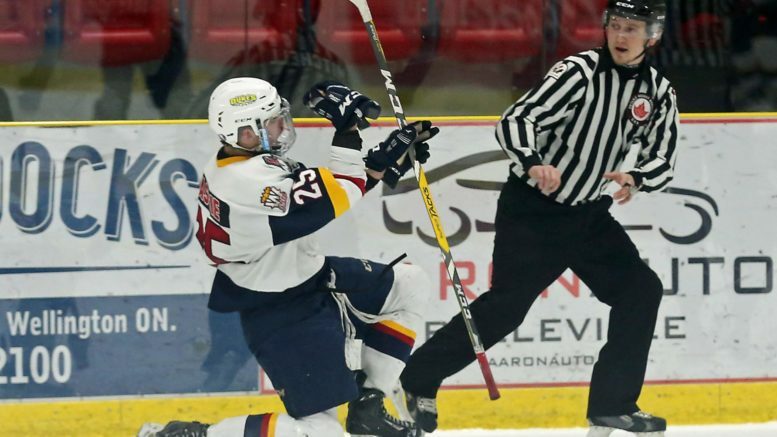 On Friday, Wellington would get outshot heavily by the visiting Blades, the number three ranked team in the Canadian Junior Hockey League, but emerge victorious in game that saw each time score three times in the final stanza. Wellington would take its first of four leads in the game at the one minute mark of the first as Daniel Panetta’s effort bounced off a Blades defender and fooled Oakville starter Will Barber. In the second, Oakville got on the board when Josh Nixon beat a Wellington defender and broke in alone on Dukes goaltender Logan Bateman, depositing a nifty backhand effort into the home side’s net. Wellington got that goal back at 15:52 as Zach Uens skated in on an odd man rush and popped the water bottle over Barber’s shoulder and put the Dukes back in the driver seat at 2-1. But again the Blades answered and it was Thomas Maia deflecting a Garrett Pyke point blast just under two minutes after the Uens tally. Tied as 2-2, Dukes fans enjoyed a wild and woolly third period. Wellington staggered the Northwest Conference leaders early in the frame as Keenan Eddy picked the corner on Barber just 30 seconds into the contest. Exactly 30 seconds later, it was Andrew Rinaldi banging home home a rebound to put the Dukes ahead 4-2 early in final stanza. The Blades re-honed their game quickly however and Pyke lead his club back from the brink. The defenceman set up Kyle Lewis at 5:14 and would bag an equalizer off an odd man rush just over two minutes later. Tied at 4-4 with under three minutes to play, Pyke would rip a powerplay point shot past Bateman to give Oakville its first lead of the contest. Wellington would dig deep and catch a break in the final seconds. With Bateman on the bench in favour of an extra attacker, the Dukes would keep the puck buried in the Oakville end. Wellington would work the disc to the front of the Oakville net a sprawling Tanner McEachren would slide into Barber, taking the goaltender out of the play. Rinaldi would pick up the loose puck at the side of the Blades net and see Barber out of the crease and Elijah Gonsalves in the slot with just a defenceman between Wellington’s bid to tie the game and a loss. With 22 ticks left, Rinaldi would feed Gonsalves who made not mistake, whipping a one timer into the open net to make it a 5-5 game. With one exhilarating portion of the game out of the way, the teams would combine for some spectacular sequences in the four-on-four and three-on-three sessions. Gonsalves (twice) and Frank Vitucci had a glorious chance to end the game with breakaway efforts in the second overtime period. Finally, with time winding down, it was Vitucci knifing the puck to a wide open Massie at mid ice with just six seconds left in the game. With Massie chugging to the goal line, the St. Lazare, QC native turned the chair on Barber, opening the goaltender up and shaving the puck between the wickets for a game winner with two seconds on the clock that set of a period of delirium inside the Lehigh Arena in what was surely one of the wildest regular season finishes in Wellington Dukes history. A night prior, Wellington’s win over Kingston was far less dramatic but just as clutch. Wellington held period leads of 1-0 and 3-1 in a road battle where Vees netminder Alexei Masanko kept his club in the game as long as he possibly could. Kingston’s Andrew Suriyuth would score a powerplay goal with just under seven minutes to go to put the game in question at 3-2 in favour of Wellington. But the Dukes would get the dagger with just over four minutes as Jacob Thousand set up Eddy for the Duncan, BC native’s ninth of the season. Kingston, who had a dozen powerplay opportunities to Wellington’s four extra man advantages, would score a meaningless powerplay goal with six seconds left to make it a 4-3 final. Wellington’s game scheduled for Monday in Cobourg was canceled due to a storm as will be rescheduled at a later date. Wellington’s lone action this weekend is Friday night when the team travels to Lindsay to take on the Muskies. In terms of the 2019 OJHL playoffs, the action will remain inside the divisions as the top four teams will be whittled down to one through divisional semi finals and finals prior to a East Champion taking on a South champ in the Conference finals. Wellington is currently holding fourth spot and would open its 2018 Buckland Cup title defence in Cobourg if the season ended today. The winner of that series would play the winner of the Whitby-Trenton series for a chance to play the winner South division playoff champ.